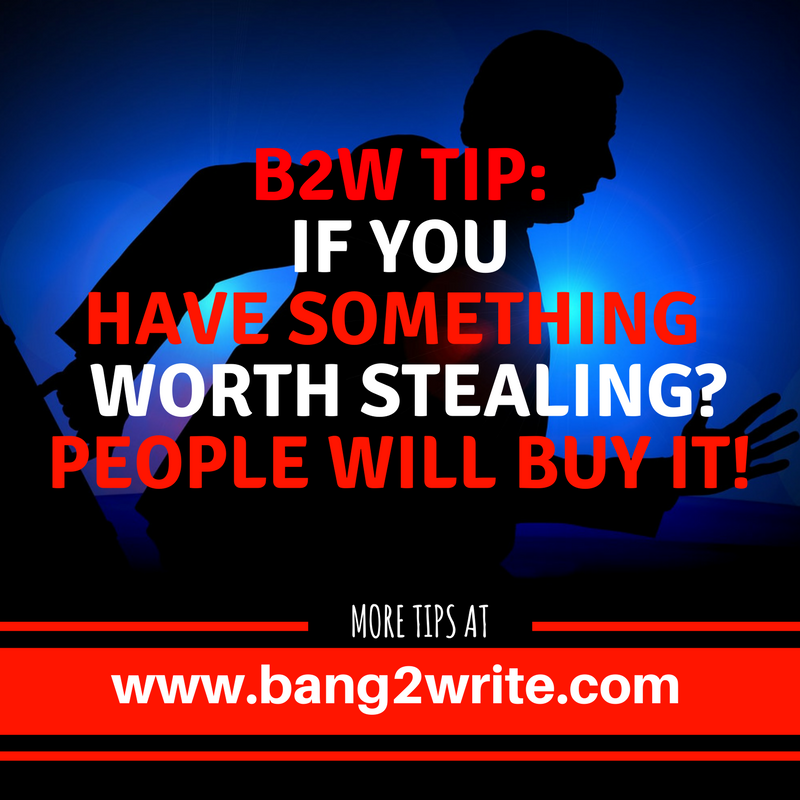 Get This, Writers: No One Will Steal Your Script! Will someone steal your script, if you send it anywhere? You are not alone in wondering this. There are so many ‘cases’ out there in internet-land to read, especially those relating to movies we’ve all seen, such as The Matrix and Coming To America. But I can’t stress enough: no one is **out** to steal anyone’s scripts or ideas as standard (despite what internet searches and crazy people on bulletin boards and Facebook groups insist). 1) It’s bad business sense to steal! If a producer, publisher (or whomever) steals a script off someone, s/he would soon become very unpopular in their circle … And this scriptwriting/filmmaking malarkey is a MUCH smaller pond than you might think. This industry relies on relationships, so even if that person was very tempted to pluck a script out of the pile and steal it, it’s actually a lot easier – and more lucrative, long term! – to buy it. Whilst I’m not keen on making generalised divides between “grades” of writers, in my experience, script “stealing” is generally something NEWBIE writers worry about. In fact, pro writers and more seasoned Bang2writers give this issue very little thought at all. They even know it’s DESIRABLE to show their scripts to as many people as possible and this practice can even make them better! Please note, I’m NOT trying to be patronising. I just want to describe this notion: we all have to start somewhere and our first scripts are NEVER the best we can do (even if they’re good scripts!). This is because we’re still learning and evolving as writers. I’m not just saying this to be harsh. Maybe your script is a GREAT example of craft, with a fab premise at its heart? Brilliant, good for you! Scripts should always be the best we can make them before we send them out. But seriously, who produces or publishes a work *as it is*, without any input or development? ‘Cos I legit can’t think of anyone. Again, it would be bad business sense. In addition, if someone will have to find the money to fund that project,, they will want some creative input for that money! ONE biopic of various historical figures and so on and so forth. The industry is fuelled on the notion of “the same… but different” and this would be completely blown out of the water. Writers’ hands would be LEGALLY TIED by what had gone before! It would be a disaster for creative people. YIKES! 5) Don’t think ‘steal’, think ‘same idea’! Believe it or not, there ARE ever-popular ideas! This industry trades in ideas and drafts and the development wheel is always churning. Some ideas go round and round and round for YEARS, decades even! TRUST ME when I say I’ve seen all these stories a MILLION TIMES BEFORE (and those I’ve listed are just a small number). That’s not to say you shouldn’t write them … Familiar ideas show there is a “need” for that story audience-wise, if done right. But if you see a movie or book go into production that’s SIMILAR to the one *you* wrote? Don’t think, “My idea’s been stolen”, think “someone had the same idea as me”. It’s SOOOOOOOOOOO much more likely! So, chill writers! No one is out to steal your script as standard. So get those scripts written, get feedback on them, get them rewritten, get them out there. 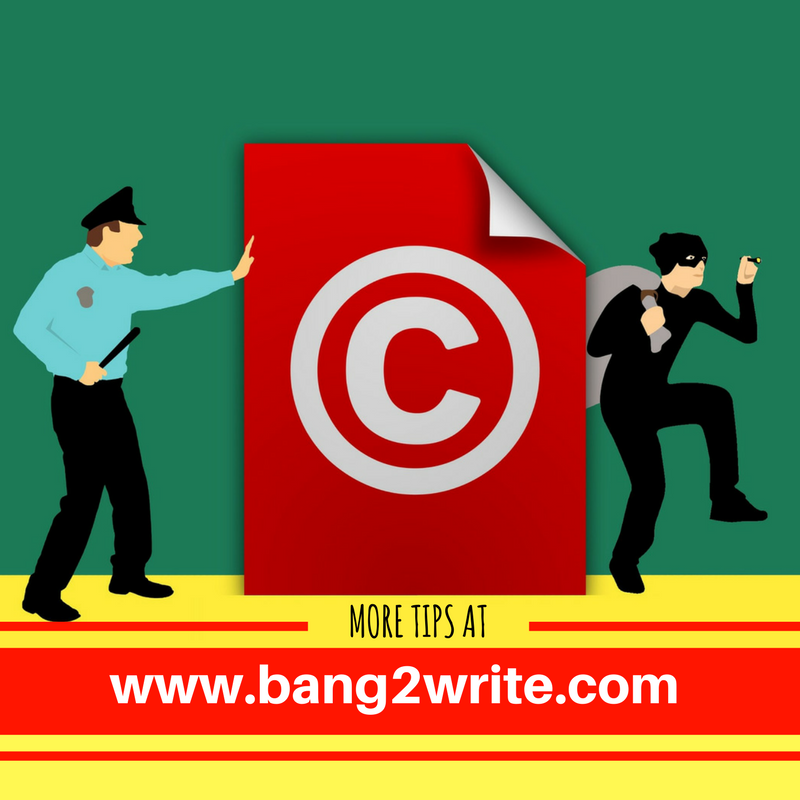 Here’s a fab (short) factsheet on UK Copyright Law for British Bang2writers. Remember, if you’re from another country you will need to check out what copyright law is in your territory, because it varies. 10 Responses to Get This, Writers: No One Will Steal Your Script! Great post, clearly explains everything I usually end up ranting and nonsensically rambling about when fellow writers say 'I'd tell you but i'm worried the idea might get out' etc. Pretty much all the basic ideas are out, I find myself more often than not trying to figure out how to execute the same story that's been told over the years in a different way. I've never been able to understand how dumb people can be about 'ideas'. I've even created a blog where I post ideas and give suggestions about how to follow them through. Who cares? No one cares! Ideas are like a**holes, everyone has one and they all think their's doesn't stink. Recently I had someone contact me who wanted help developing an idea into a feature script and they insisted I sign an agreement before they would let me look at it. I wrote back and told them a few home truths about ideas, copyright and paranoia. I wasn't surprised when I didn't hear back from them. I also heard a tale years ago about a couple of newly graduated lads from a scriptwriting course who wanted to set up a business selling script ideas to production companies. The person they told this to quite rightly laughed in their face. I find that most non-writer friends worry about this when I tell them about sending my scripts out. I tell them, they’re either thinking about people literally taking my entire script, as is, and taking credit for it – which is absurd, because any writer can easily prove that they wrote the piece – and if it ever got into production, the lawsuit would be so easy to prove, that it’s crazy to think anyone would go that route. And the other idea is, they see my script, but modify it to be their own. Something that can take months or years, and skill. If the person supposedly stealing the idea is a producer (who doesn’t write), then what are they going to do – hire a writer to work on the script? It’s a silly idea. Having re-drafted my manuscript with the benefit of your highly professional advice, Lucy, as well as that of a competition script reader, I also ran it past a well-known professional actor (whom I know slightly and who’s read more scripts than I’ve had hot dinners). He loved it, by the way, though his advice was ‘when a producer takes it up [he said ‘when’, not ‘if’] make sure they don’t get a staff writer to re-write it’. I imagine that’s a potential pitfall. Do you let them tweak it, so long as your name is in the credits, or, if it’s so far removed from your draft that it’s no longer your work, do you kiss goodbye to your research and your creative ideas and let them produce it under the staff writer’s name? Not that I’ve reached this dilemma – yet. As a script editor, I once had to sign a non-disclosure agreement before the writer would send her first-draft-iest first draft. Eeek!! Yes lots of newbie writers ask me and I always refuse because I will not add to the culture of paranoia. Many proceed anyway and this helps them get over their fears. Others will then not use my services, but that’s fine by me.